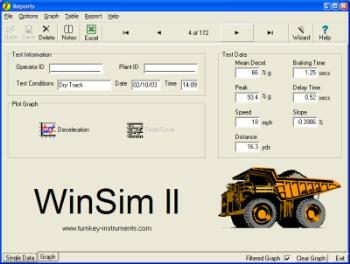 WinSim II is a Windows program that will download brake test results from your Simret brake tester into your PC. Brake tests, including graphs, can be displayed on the screen and printed. WinSim II also organises the brake tests into a database, which can be searched, for example by combinations of test date, examiner, vehicle name and instrument serial number. Comments and notes about the test conditions can also be added to each test using on-screen memos. Tests can also be exported to Excel if required. A scheduling section facilitates graphing of average test results over a period of up to one year. Vehicle testing schedules can also be planned and signed off. WinSim II latest update: version 1.1.2 (this wont work unless you already have WinSim II installed).